The UAE surely has some really enchanting places across the country. While in Dubai, one can easily take off to visit these places and enjoy a truly fun-filled road trip along the way. In that spirit, let’s look at some really special places which you can easily visit from Dubai. Almost 200 kilometres away from Dubai is Khasab, a small port city in Oman’s northern exclave. The drive till here is especially fun; if you do not have (or wish to take) your own vehicle, you can always hire a car from Speedy Drive. The fjords here are especially remarkable and reminiscent of the ones in Norway, which is why Khasab has the moniker of being the Middle East’s Norway. One precaution on any trip to Khasab would be to double check if you are allowed to take your vehicle here, given that you will actually be going to another country. Dibba is comfortably located about 130 kilometres from Dubai. On a journey here, you will really enjoy the drive, especially the scenic views along the way with mountains on one side and the sea on the other. You will also find Dibba to have its own quaint charm, a far cry from the hustle and bustle of Dubai. In Dibba, we definitely recommend going to Dadna Beach. Almost 300 kilometres away from Dubai, Liwa lies in the midst of its own resplendent oasis, down south in Abu Dhabi Emirate. The road till here is really fun to drive, especially since it does not witness a lot of traffic. If a long, romantic drive is what you have been seeking, then a trip to Liwa would be just perfect! The long coastline of Fujairah is ideal to go scuba diving. 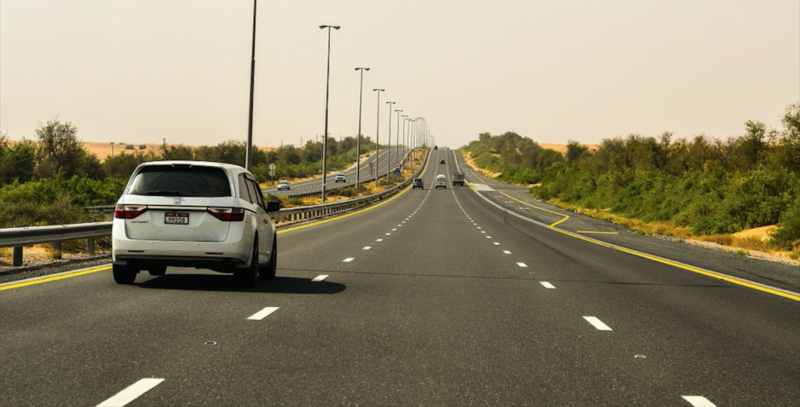 Moreover at a little short of 200 kilometres from Dubai, the drive is long enough to have a memorable road trip. Once in Fujairah, don’t miss visiting the beautiful Al-Hayl Castle there as well as Fujairah’s historic fort. At a relatively modest 112 kilometres from Dubai, Ras Al Khaimah enjoys a unique place in the hearts of many road trip enthusiasts. After all, the drive till here is really enjoyable. At the same time, there is so much to do once in Ras Al Khaimah including horse riding, paragliding and much more. There are many fascinating places that you can easily visit from Dubai, comfortably taking off in a rental car from us here at Speedy Drive.